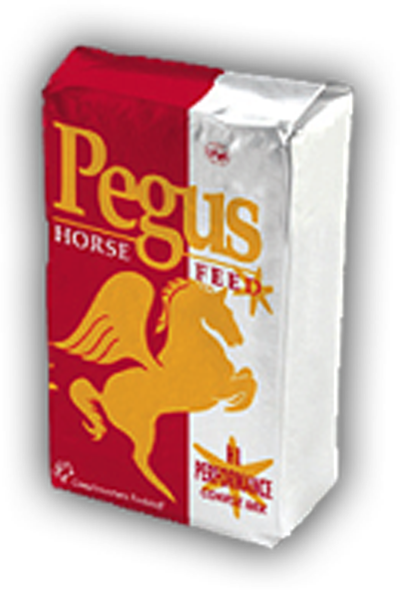 Pegus Horse-health Cube Low GI is a low starch formula fully fortified feed, containing super fibres and high energy fat supplement Rice Bran. balanced energy levels due to lower blood sugar and insulin spikes following a meal. higher levels of antioxidants which are also essential to aid recovery and reduce tissue damage. Late gestation, Store horses, Hunters, Pre-training, racehorses, trotters. A special formulated low molasses, oat free mix with a blend of grains and fibres. This delicious mix has been developed with cooked grains and fibres coated with soya oil for cool energy. Offering a lower sugar index than standard feeds. Providing a slower release of energy for the excitable competition horse and pony. Fully fortified with Pegus Equine premix supplement ensures that your horse has their fully daily balanced vitamins and minerals. Suitable for all types of horses and ponies, Eventers, Dressage, Showjumpers, Pony Club, Showing, etc. This classic sweet feed has an oat-free formula and uses the finest blended and ‘toasted’ grains to ensure maximum digestibility for your horse allowing for a safer digestion of starch in the gut system. This highly palatable feed is fully balanced with the Pegus Equine pre-mix supplement.Protein is added for excellent muscle tone and tissue strength during exercise, and soya oil is added for slow release energy, better stamina and shiny glossy coats. Perfect all round feed, high fibre, low energy feed. Contains lower starch levels than a mix with double cooked grains for better digestibility and healthy gut function. 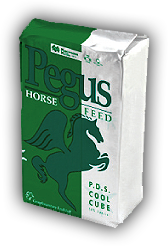 Fully balanced with the Pegus Equine pre-mix supplement and protein for excellent muscle tone and tissue strength during exercise, PDS Cool Cube provides a lower starch alternative for excitable horses and ponies in competition. Suitable for all types of horses and ponies, Eventers, Showjumping, Dressage, Showing, Pony Club, Early gestation, Store horses. Foundation feed of Pegu and still the choice of many riders, this is a high fibre, medium energy feed. Contains lower starch levels with double cooked grains for better digestibility and healthy gut function. Fully balanced with the Pegus Equine pre-mix supplement and protein for excellent muscle tone and tissue strength during exercise, Hunter & Pony Complete provides a lower starch alternative for excitable horses and ponies in competition. Suitable for all types of horses and ponies, Eventers, Showjumping, Dressage, Showing, Pony Club, Early gestation, Store horses, Hunters, Pre-training. Highly palatable blended sweet feed mix designed to meet the demands of horses in hard work or requiring a faster release speed of energy. Using only the best tested Irish oats and toasted cereals, this feed provides readily available energy to meet the needs of the horse’s anaerobic respiration during periods of fast and demanding work, as well as providing the organs and tissues with essential vitamins and minerals for improved function. 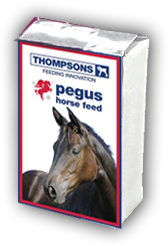 Also includes Pegus Equine pre-mix supplement and proteins for excellent muscle tone and tissue strength during exercise, higher levels of antioxidants which are essential to aid recovery and reduce tissue damage. Pegus blended oil aids stamina and reduces lactic acid production, a major factor in limiting performance. Suitable for Eventers, Showjumpers, Trotters, Racehorses, Broodmares early lactation, Breeze-ups, Polo, Hunters. These high energy cubes offer a lower starch alternative to Hi Performance mix. Contains lower starch levels than a mix offering double cooked grains for better digestibility and healthy gut function. High Performance Concentrate is fully balanced with the Pegus Equine pre-mix supplement and protein for excellent muscle tone and tissue strength during exercise, with higher levels of antioxidants which are also essential to aid recovery and reduce tissue damage. Can also be used as a follow on feed plan with yearlings after Pegus Junior as sales prep. Suitable for all types of horses and ponies, Eventers, Showjumping, Dressage, Showing, Pony Club, Early gestation, Store horses, Hunters, Pre-training. Designed for the higher demands on the equine athlete. This highly digestible and energy dense cube uses only the best tested Irish oats and toasted cereals to provide readily available energy to meet the needs of the horse’s anaerobic respiration during periods of fast and demanding work. 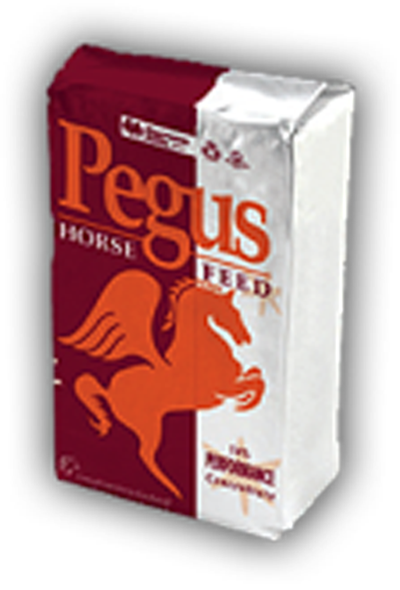 It also provides the organs and tissues with essential vitamins and minerals for improved function with Pegus Equine pre-mix supplement and proteins for excellent muscle tone and tissue strength during exercise. The higher levels of antioxidants are also essential to aid recovery and reduce tissue damage. Premium Racehorse Cube also contains Super Fibre technology; this increased fibre availability offers almost equal energy as typical grain diets, yet adding by reducing starch dependency and reducing muscle fatigue and chances of hind gut acidulous. 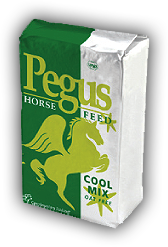 Pegus Chaff is a lightly molassed high fibre oat straw chaff with the addition of limestone flour and salt. You can be sure your horse or pony has a palatable feed that also provides an adequate level of calcium and salt in its diet. 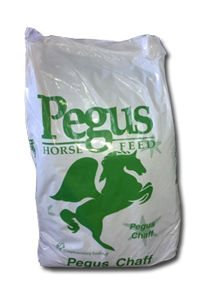 Pegus Chaff original is ideal to mix with a concentrate feed to increase chewing time, digestibility and keep your horse occupied for longer. It ccan also be used as a partial hay replacer when forage is short.